I've got a son in first grade. And like most first graders, he's absolutely enthralled by video games - "Skylanders", primarily, but also "Clash of Clans" for iPad and "Mario Kart 7" for 3DS. While I don't game much anymore, I can still appreciate the obsession - after all, I was a member of the very first generation of kids to spend all day with home videogame consoles. And I was even more obsessed than my kid is today. The Great Video Game Crash happened when I was about 9 years old. I didn't even notice. I was too busy playing "E.T." and "Swordquest: Fireworld on our first game system - the Atari 2600. Eventually, we moved on to an NES, then a Genesis, and then an N64, and then a PS2. But this post isn't about those console games - it's about the games we played on our home computers. 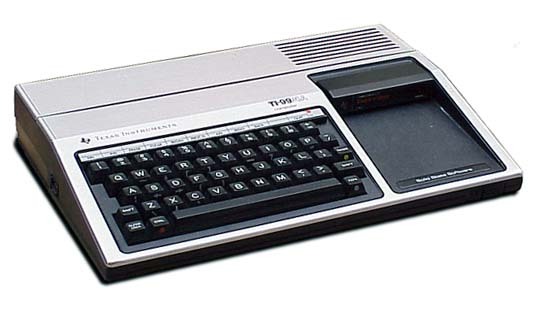 Starting with our first computer, which wasn't even a Macintosh OR an Apple II - it was a Texas Instruments TI-99. Yes, before they became the gold standard for graphic calculators, Texas Instruments used to make home computers! Games for this computer system came on cartridges. There was a keyboard, so you could also program in BASIC, but I didn't have any way to save any programming, so I primarily just 20-GOTO-10'ed "Matt Rules" and got back to video gaming. There were some decent arcade ports for the TI-99 - their versions of Pac-Man, Donkey Kong, Frogger, and BurgerTime were better than anything else on the home market (with the possible exception of ColecoVision). I didn't have any of those games, so I can't really review them. I mostly had TI exclusives, for some reason. So that's what's going to make up our High Five today - "My Five Favorite TI-99 Games That I Actually Owned." Okay, I lied. This one was, more or less, a direct arcade port. TI probably tried to change this game juuuust enough to avoid copyright claims. But even the alien ships designs were identical. To paraphrase Futurama, it featured "Invaders.... possibly from Space!" 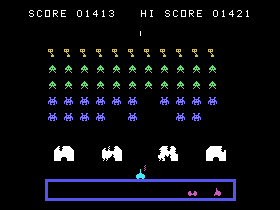 It was also WAY better than Atari 2600 Space Invaders. And it had a cool "subterranean base" where your extra guys waited to enter the fray, and where they were carted off to after they were destroyed. 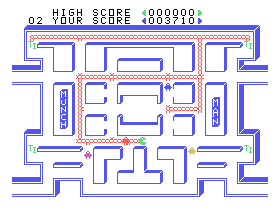 Speaking of changing a game JUST enough to avoid lawsuits.... "Munch Man" featured a round character who navigated a maze "munching" pellets while avoiding attackers - and occasionally eating a power pellet that would allow Munch Man to turn the tables and eat the attackers. This one seemed to be a little bit TOO much on the nose. So just before release, they got rid of all of the pellets, and changed the game so that Munch Man didn't "munch" anything - he laid down chains wherever he'd been. And the power pellets were now the letters "TI". This game was incredibly popular. We all had Pac Munch Man fever! NOW we're getting somewhere. "Alpiner" was a great game. And it was a unique game - not a knockoff or port of an arcade game. It was also incredibly difficult. Your character - the Alpiner - is free-climbing the highest peaks on Earth: Mt. Hood, the Matterhorn, Mt. Kenya, Mt. Garmo, Mt. McKinley, and Mt. Everest. Your character was huge, which made it difficult to avoid obstacles - and some of those obstacles were fast-moving. 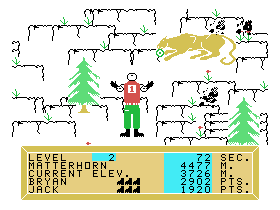 Rock slides, avalanches, bears, Angry Birds laying rotten eggs on your head, snakes, mountain lions, and (on Everest), the Abominable Snowman, who was skiing for some reason. I absolutely loved this game. Someone should update and re-release it immediately. "Moon Mine" was a first-person pseudo-3D view out the front of some kind of mining tank, driving forward, deeper and deeper down a mine corridor. Presumably on the moon. You had 2 sets of laser guns - one of which could be moved horizontally, and the other of which could be moved vertically. Monsters would move toward your vehicle from the center of the screen (sort of like "Tempest"), and you'd zap them with one set of the laser guns. Occasionally, you'd happen across precious metals, the mining tank would stop, and a crew member would exit the tank and run out into the corridor to pick it up, while monsters attacked him. Making matters more difficult - your lasers could overheat if you used them too much, and you needed to find water for those systems. So, you're searching for minerals and water, zapping monsters while making sure not to overheat your systems, and occasionally jumping out of the tank to go solo. That's a lot of action for 1983! Basically, the gold standard for the TI-99. Parsec was, basically, the "proto-Gradius": a side-scrolling, pseudo-vector-graphics "spaceship moving over a landscape" game. 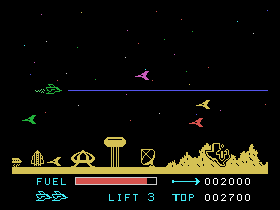 You'd fire lasers at alien spaceships which approached from the right - and occasionally from behind. The star field behind your ship would twinkle, and ship explosions were beautifully rendered. It had digitized voice warning you of dangers ahead. After successfully defeating a level, you'd enter an *asteroid belt*. You had to steer your ship through an underground tunnel to refuel it! This game came out in 1982, and it was absolutely fantastic. It still holds up today.